Pictured with Warthog are, from left, Mehmet Kocamaz, Conor Gilsenan, Kevin Graney, Christopher Rasmussen and Yan Lu. 9:05 a.m., June 23, 2010----A team of University of Delaware graduate and undergraduate students traveled with their robot Warthog to Detroit from June 4-7 to compete in the 18th annual Intelligent Ground Vehicle Competition (IGVC). Three years after its first entry garnered "rookie of the year" honors, Warthog is now a top competitor. An international field of 58 teams from schools such as Olin College of Engineering, the U. S. Naval Academy, Penn State, Princeton, Georgia Tech, the University of Waterloo, and Hosei University in Japan registered for IGVC. Christopher Rasmussen, an associate professor in UD's Department of Computer and Information Sciences, said the team was “really pleased with our performance this year. It was a very competitive field and despite some last-minute hardware problems, we were still able to place high." The competition is centered on two separate challenges involving autonomous path-following and navigation while avoiding obstacles in an outdoor environment. For the overall standings there is also a design component requiring a written report and oral presentation by the students in front of a panel of judges. Thirty-one robots demonstrated enough proficiency to qualify for the official day of competition on June 7. Over the course of the day each robot was given multiple runs on the two challenge courses, and when the dust settled, Warthog had fought its way to third place in the autonomous challenge and fourth place in the navigation challenge. 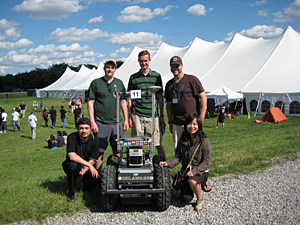 In 2009, the team won the autonomous challenge outright and was third in the navigation challenge, placing second overall. Since 2007 Warthog has won more than $6,000 in prize money. Warthog is based on a rugged four-wheel platform manufactured by Segway and is equipped with stereo omnidirectional cameras, a laser range finder and a differential global positioning system (GPS). One key innovation this year was the development of an iPod Touch application for remote control and monitoring of the robot. Traveling to Detroit with the team were Conor Gilsenan, a 2010 computer and information sciences graduate; Kevin Graney, a rising senior computer science and Honors Program student; and Mehmet Kocamaz and Yan Lu, both graduate students in computer and information sciences. Kevin Schultz, a 2010 mechanical engineering graduate, was also on the team. Rasmussen is the team's adviser. After such a string of success, Rasmussen says that the team is ready for next year and expects to be at the top of the field once again. The Intelligent Ground Vehicle Competition is sponsored by the Association for Unmanned Vehicle Systems International.